This document provides a high-level Summary and Analysis of data collected from Canadian jurisdictions in 2016 on policies and provisions related to public health surveillance of the Zika virus. The 2016 Zika Environmental Scan Results can be accessed through the National Collaborating Centre for Infectious Diseases (NCCID) website. The purpose of this data collection and analysis is to use the Canadian experience of responding to the Zika virus to support the enhancement of surveillance and reporting of emerging infectious diseases in Canada. This includes increasing the cohesiveness of the national system in the context of the International Health Regulations (IHR) supported by the World Health Organization (WHO). Production of this document has been made possible through a financial contribution from the Public Health Agency of Canada through funding for the National Collaborating Centre for Infectious Diseases. The views expressed herein do not necessarily represent the views of the Public Health Agency of Canada. This document provides a high-level Summary and Analysis of data collected from Canadian jurisdictions in 2016 on policies and provisions related to public health surveillance of the Zika virus. The 2016 Environmental Scan Data can be obtained through the National Collaborating Centre for Infectious Diseases (NCCID) website. The purpose of the data collection and analysis is to use the Canadian experience of responding to the Zika virus to support the enhancement of surveillance and reporting of emerging infectious diseases in Canada. This includes increasing the cohesiveness of the national system in the context of the International Health Regulations (IHR) supported by the World Health Organization (WHO). Health surveillance is a core public health function in Canada and around the world. It is essential for the production of accurate and timely intelligence on the health of the population, it facilitates public health planning and decision making, and guides effective responses to emerging issues and public health challenges (e.g. Zika virus outbreak). “Acting in the absence of [surveillance] information can have immediate and disastrous consequences for individuals or whole populations” (PCPHN, 2016, p7). • lack of knowledge of data holding amongst systems (PCPHN, 2016, p11). The Canadian surveillance system was tested in 2015-2106 during the international Zika virus outbreak. This provided a natural opportunity to examine the policies and provisions for public health surveillance in relation to emerging infectious disease and learn more about the Canadian surveillance system in the international context. The international Zika outbreak of 2015-2016 was declared a public health emergency of international concern (PHEIC) by the WHO for the period of February 1 to November 18, 2016. Following the declaration, the WHO issued a request for international reporting of Zika from all member states. Clinical, virologic and epidemiologic data related to increased rates of microcephaly and/or Guillaume-Barre Syndrome was also requested to contribute to global knowledge of possible complications and sequelae of the virus. As the International Health Regulations (IHR) National Focal Point (NFP), the Public Health Agency of Canada initiated engagement with provinces and territories on national reporting of Zika virus and affiliated sequelae. Responses to the Agency’s reporting request varied across provinces and territories due to the particularities of the international epidemic and the legislation and regulation in each jurisdiction. Following these discussions, NCCID received a request to conduct an environmental scan across the country of existing legislative and regulatory frameworks to collect, use and disclose personal health information on Zika infections and other emerging infectious diseases. The intention was to use information from this scan to inform policy changes that could improve response and surveillance of emerging infectious diseases in Canada, including Zika. Data were collected from August to December 2016 via an interview and questionnaire completed by an expert contact designated by the Chief Medical Officers of Health in each jurisdiction. The focus of the questionnaire was on the Zika virus as a case example, and included questions about notification authority/legislation, data collection authority/legislation, elements and protocols, and implications of a declaration by WHO as a Public Health Emergency of International Concern (PHEIC). Legislation was collected and reviewed from each responding jurisdiction across Canada. Most provincial and territorial (P/T) regions responded (11 of 13), as well as the Public Health Agency of Canada (PHAC) at the federal level. The experts designated by the Chief Medical Officers of Health in each participating jurisdiction were consulted through multiple rounds of data collection and verification. The result was the Environmental Scan Data 2016 which describes relevant public health policies (including legislation, regulations and authorities) for public health surveillance across Canada. Links are provided to legislation and regulations in each jurisdiction. However, links to relevant guidance documents and signed agreements were included where possible but were not consistently reported. The spreadsheet version of the Environmental Scan Data 2016 was provided to the federal, provincial and territorial (F/P/T) authorities, and preliminary themes and analysis based on the data were presented at the Canadian Public Health Association (CPHA) conference in June 2017 “Responding to Zika: a cross-jurisdiction scan of policies and provisions for public health surveillance of emerging infectious diseases in Canada” (Balakumar, 2017). As noted earlier, public health surveillance is a core function of public health in Canada and around the world. It provides the starting point to produce the necessary intelligence on the health of the population and guides effective responses to emerging issues, among other things (PCPHN, 2016). Surveillance systems for emerging infectious diseases need to be part of wider surveillance systems, especially in relation to structures that bridge from the local to provincial/territorial and national levels. The local level is usually the first line of detection of new or emerging diseases, including those that are not designated as reportable. Public health authorities may not be involved in surveillance until it involves a reportable situation, so there needs to be linkages/protocols and structures to support them across the wider system. See Figure 1 for a visual description of the flow of surveillance information in the Canadian context. The legal basis for public health surveillance in the provinces and territories is set out in public health legislation in each jurisdiction, particularly in relation to regulations governing infectious diseases (see the Environmental Scan Data 2016). The regulations use a list of reportable diseases requiring specific measures as the basis for implementing reporting systems and requiring action by local authorities, health practitioners, laboratories and others. At the federal level, the Department of Health Act and the Public Health Agency of Canada Act are the main source of the mandate for national public health surveillance. A central challenge to having a robust and effective surveillance system in Canada is the sharing of information of across jurisdictions. At this time, data sharing across governments primarily relies on informal mechanisms and collegial relationships (PCPHN, 2016). These are supported by more formalized structures to collect health information at the national level, including Statistics Canada and the Canadian Institute for Health Information (CIHI). For example, CIHI has played an important role in responding to the recent opioid crisis through the provision of hospital and emergency room administrative data to public health decision makers across Canada. They are critical partners for improving data quality and building public health surveillance capacity. To address the issue of information sharing, the F/P/T Multi-Lateral Information Sharing Agreement (MLISA, 2014) came into force in October 2014 (Text Box 2). This agreement describes when, what and how infectious disease and emerging public health events information will be shared between and among jurisdictions. The agreement includes both mandatory and optional requirements to guide information flows related to governance, data management and public health events of international concern (PHEIC). It is designed to have technical annexes added over time based on national surveillance priorities as they are developed (PCPHN, 2016). (PCPHN, 2016). The Government of Canada also has responsibilities for certain federal populations, including First Nations, Inuit and Métis peoples, as well as federally incarcerated prisoners. MLISA is a legal agreement that articulates how and what data on infectious diseases and urgent public health events will be shared between participating jurisdictions. The agreement between the provincial, territorial and federal governments came into force in October 2014. The main body of the document outlines how information will be shared between and among jurisdictions, while continuing to respect the existing legislation within jurisdictions. It notes that existing separate agreements should be aligned with the MLISA within 5 years. It also specifies that other than mandatory obligations, the terms of the agreement are “principles intended to guide the Parties in the Exchange of Public Health Information and a Party is only required to make its best efforts to fulfill the terms of this agreement” (MLISA, Part 3). 8. Mandatory Obligation – The Parties agree that in Exchanging Public Health Information permitted under this Agreement, and in the development of Technical and Supplemental Annexes, the following principles will apply: (a) Aggregate Information will be Exchanged wherever possible; (b) Record Level Information will only be Exchanged where Aggregate Information is not sufficient to meet the purpose of the Exchange; (c) Identifying Information will only be Exchanged where Aggregate and Record Level Information are not sufficient to meet the purpose of the Exchange; and (d) in all Exchanges of Public Health Information, the Exchange will be limited to the minimum amount of Public Health Information which is necessary for the purpose of the Exchange. The agreement includes Annexes on governance, data management and public health events of international concern (PHEIC). The model for this agreement is one that allows the addition of technical annexes over time, based on agreed upon national surveillance priorities. 17. (d) if Notification is made, or if a PHEIC is declared by WHO, the CPHO and the Affected Parties will continue to Exchange Public Health Information for PHEIC Purposes, including ongoing monitoring and reporting to the WHO, which Public Health Information should include where possible: (i) case definitions, (ii) laboratory results, (iii) source and type of the risk, (iv) number of cases and deaths, (v) conditions affecting the spread of the disease, (vi) the health measures employed, (vii) the difficulties faced and support needed in responding to the PHEIC, and (viii) any other Public Health Information agreed upon by the Parties. Canada is a signatory to the International Health Regulations (IHR), which were revised and approved by the WHO in 2005. This international treaty provides a framework for the coordination and management of events that may constitute a public health emergency of international concern (PHEIC) (WHO, 2005) (See Text Box 3). The International Health Regulations (IHR) (2005), represent an agreement between 196 States Parties (countries) around the world, including Canada, to work together for global health security. This binding instrument of international law entered into force on 15 June 2007. Through the IHR, countries have agreed to build their capacities to detect, assess, report and respond to public health events. The World Health Organization (WHO) plays the coordinating role in IHR and, together with its partners, helps countries to build capacities. Under the IHR (2005), States Parties must notify WHO of “all events which may constitute a public health emergency of international concern” (PHEIC). These events include any unexpected or unusual public health event regardless of its origin or source. A PHEIC is defined in the IHR (2005) as, “an extraordinary event which is determined to constitute a public health risk to other States through the international spread of disease and to potentially require a coordinated international response”. This definition implies a situation that is: serious, sudden, unusual or unexpected; carries implications for public health beyond the affected State’s national border; and may require immediate international action. (a) Is the public impact of the event serious? (b) Is the event unusual or unexpected? (c) Is there a significant risk of international spread? (d) Is there a significant risk of international travel or trade restrictions? The IHR National Focal Point (NFP) in Canada is located at the Public Health Agency of Canada. IHR activities are a shared responsibility and as such, the NFP functions are supported by Canada’s Health Portfolio and by other federal, provincial and territorial government departments. IHR notifications and information shared with the WHO are developed in consultation with the reporting jurisdiction. Surveillance roles and responsibilities derive from a broad range of policies and provisions, from the less formal (guidance documents) to the more formal (signed agreements, legislation and regulations). The Environmental Scan Data 2016 document contains a description and links to key legislation and regulation provided by each province and territory, and at the federal level, that define government authority related to surveillance of emerging infectious diseases. There are a few interesting observations that can be made by comparing provincial, territorial and federal surveillance policies and provisions in relation to the Zika virus outbreak, with implications for emerging infectious diseases in general. It is important to recognize that the way in which an emerging disease is made reportable is important. If it is added to the list of reportable diseases, then protocols around what information needs to be collected and reported are consistent with other infectious diseases on the list. In that case, the public health act generally supersedes the health information privacy act, allowing for data that identifies individuals to be collected to support case follow up by public health. However, if the emerging disease is not added to the list, jurisdictions must interpret the legislation and regulations on a case by case basis to determine what information should be collected and shared. This has clear implications for a timely and consistent national response. Saskatchewan is one of 2 Canadian jurisdictions that have revised legislation and/or regulations to strengthen their public health surveillance system since the Environmental Scan was conducted in 2016.  Both the Saskatchewan Public Health Act and Disease Control Regulations were amended in 2017. A significant change in the Regulations includes a definition of emerging communicable disease that requires a disease be identified as new, increasing or of concern, and be “designated by the chief medical health officer as an emerging communicable disease” (2(1) (d.1). The intention of this revision is to ensure that an assessment of the impact on the local population is undertaken when an emerging infectious disease is identified. The Saskatchewan experience with Zika showed gaps in the legislation around what information could be accessed under the Public Health Act. The Environmental Scan Data 2016 prepared by NCCID contributed to the process of amending the legislation in 2017. Ontario is one of 2 Canadian jurisdictions that have revised legislation and/or regulations to strengthen their public health surveillance system since the Environmental Scan was conducted in 2016. The Ontario Health Promotion and Protection Act was amended to replace “reportable disease” with “disease of public health significance”. As well, the power of the Minister was clarified with respect to emerging disease and now states: “Where the Minister is of the opinion that there exists or there may exist an immediate risk to the health of persons in Ontario from a new or emerging disease, the Minister may issue an order … to supply the Minister or his or her delegate with any information provided for in the order” (77.7.1 (1)). These changes (and others) are expected to have a beneficial impact on the Ontario surveillance system. They should speed up the process of including a new emerging infectious disease under surveillance and triggering public health surveillance and case follow up protocols associated with being on the list. database; Ontario indicated not doing case follow up by public health). Part of the concern about adding emerging diseases to the surveillance database without clear criteria about when to add and/or remove a disease is related to the additional burden on an already stretched surveillance system. In the longer term, this has implications for tracking and evaluating emerging disease surveillance across Canada. Most jurisdictions report using an ad hoc committee, or a committee used for developing case definitions and protocols for previous emerging diseases, to develop a case definition for the Zika virus (BC, AB, MB, NB, NU). Most jurisdictions also report relying on guidance and advice from PHAC (QC, NS), or aligning their definitions and protocols with recommendations from PHAC (BC, MB, NB, NU). One jurisdiction (ON) indicated that they did not have a specific Zika protocol, while the process was unclear in 3 jurisdictions (SK, NL, NT). Only Quebec noted compliance with the PHAC request to follow up on the health of children affected (in utero) for 2 years. Other regions may have done this, but it was not noted in the survey data. For most jurisdictions, PHAC leadership and support was important for the development of the case definition and protocols for Zika, particularly due to the context of Zika as a public health emergency of international concern (PHEIC) and the Canadian commitment to the International Health Regulation (IHR). The lack of a consistent process across jurisdictions, and the heavy reliance on PHAC guidance in some regions, supports the need for a national coordinating role that is timely and responsive to the particularities of a given emerging infectious disease. There has been significant attention to the collection and sharing of personal health information across jurisdictions. Each province and territory has some version of a “personal health information access and protection of privacy” act (see links in the Environmental Scan Data 2016 document). This legislation ensures that only data necessary for providing health services are collected, and that providers do not share personal identification information beyond what is necessary to provide those services. The MLISA agreement signed by the provinces, territories and federal government ensures that only aggregate data is shared across jurisdictions, unless there is a specific and agreed purpose for sharing individual record information in order to respond to a public health emergency. All jurisdictions were very clear that only aggregate data is shared unless there is a specific reason and agreement to share administrative data. Data quality is a related but separate issue to data privacy. The variation in case definition and protocols for Zika noted earlier indicates that it may not be possible to compare data across jurisdictions, depending on the population size and implications for privacy. For example, reporting of geographic location may be at the level of the province or territory, or at the sub-region level (health authority or zone reporting). Age may be reported by year, or by age range. In other cases, an individual data element may not be identified as relevant for reporting at the aggregate level. For example, data on whether the patient recently received or donated blood may not be prioritized as a reportable item at the aggregate level, making it difficult to assess implications for the blood supply across jurisdictions. Or the country of travel may be reported, but not the date of travel, making it difficult to describe a time line for national patterns of infection. Aligning the level and type of data on emerging infectious diseases with the purpose and use of the data is an ongoing challenge within and between jurisdictions in Canada. This is one of the drivers behind the proposed Blueprint for a Federated System for Public Health Surveillance in Canada (PCPHN, 2016). The core legislation and regulation for taking action on notifiable and emerging infectious diseases is in place across Canada. However, the systems and structures to support identification and surveillance protocols are variable and have yet to be formalized in many jurisdictions. This was recognized in the Blueprint for a Federated System for Public Health Surveillance in Canada and was part of the reason the framework was proposed. “The Blueprint vision and action plan is a high level framework document that lays out the core infrastructure elements and collaborative context needed for the Federated System for Public Health Surveillance in Canada. It describes the formalization of an envisioned collaborative system of equal partners who demonstrate leadership and obligate themselves to act according to their capacity and resources in ways that are non-binding and resource neutral. This formalization aims to establish the necessary infrastructure to support enhanced responsiveness, and increased efficiency and effectiveness across Canada and across jurisdictional levels. The Federated System presents opportunities for sharing existing and emerging surveillance infrastructure, without imposing a rigid singular solution. It aligns surveillance activities, while recognizing the reality of both shared and autonomous surveillance activities” (PCPHN, 2016, p.1). The PHAC Departmental Plan for 2017-18 identified collaboration with federal, provincial and territorial partners in implementing the Blueprint action plan as a key planning approach to strengthen public health surveillance in Canada. (PHAC, 2017). As noted earlier, surveillance systems for emerging infectious diseases need to be part of wider surveillance systems, especially in relation to structures that bridge from the local to provincial/territorial and national levels. Public health authorities may not be involved in surveillance until it involves a reportable situation, so there needs to be linkages, protocols and structures to support them across the wider system. At the time of the scan, most jurisdictions in Canada reported that they were currently reviewing or refining legislative and policy authorities with regard to reporting emerging infectious diseases or unusual health events. For example, there have been recent revisions to strengthen foundational legislation in certain provinces and territories (see Text Box 4: Ontario – 2017 Amendments, and : Saskatchewan – 2017 Amendments). While the importance of having legislation to facilitate public health response cannot be understated, much work is still required to ensure that timely and coordinated surveillance protocols are developed and tailored as necessary. 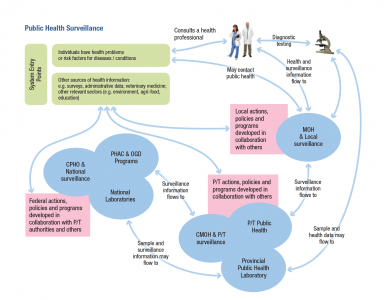 A collaborative approach that integrates emerging disease surveillance into efforts to build public health surveillance capacity at all levels in Canada is recommended.